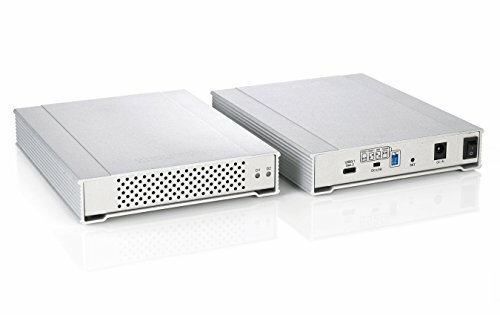 The MiniPro™ RAID V3 is a dual-drive system offering the latest Type-C connection for compatibility with USB 3.1 & Thunderbolt 3. Built entirely from aluminum, the MiniPro RAID V3 utilizes the highest quality construction for power users who need dependable storage. The rugged metal housing provides protection due to impact and drops, while acting as a heatsink for passive, silent cooling. The MiniPro RAID V3 offers flexible RAID storage management options: RAID 0 (Striping), RAID 1 (Mirroring), JBOD (independent drives) and BIG (Non-RAID merged drives). The MiniPro RAID V3 provides speeds of over 800 MB/s in RAID0 when connected to a USB 3.1 or Thunderbolt 3 port — doubling the speed of USB 3.0! Package includes: 2TB SSD MiniPro RAID V3, USB C-C cable, USB C-A cable, power adapter, user guide. Configurable for JBOD, RAID 0, RAID 1, & BIG modes. No software required.